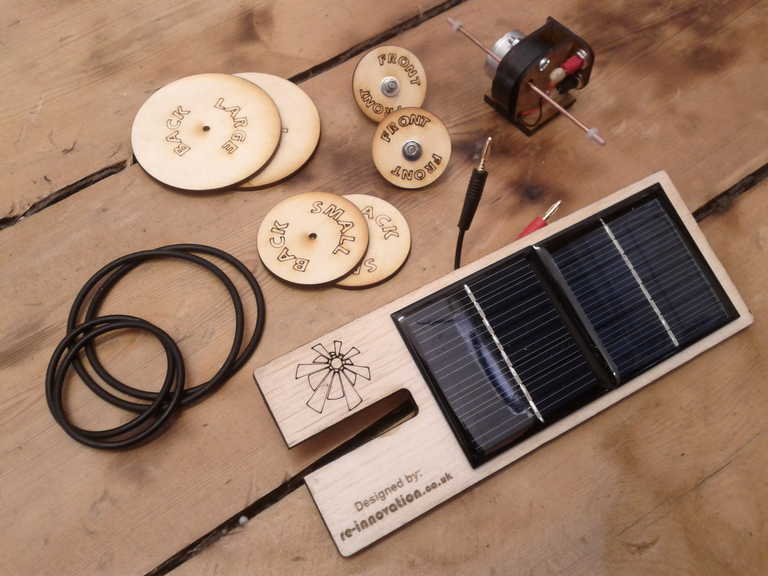 We were asked by Nottingham City Council to design and produce a selection of renewable energy demonstration kits for use with school groups of various ages. They needed equipment which could be easily assembled and taken apart, but were still configurable to a number of different designs. These are to be used as part of a day of activities about resources, energy efficiency and renewable energy. They wanted kits to demonstrate the concepts of solar electricity, wind power and hydro (water) power. 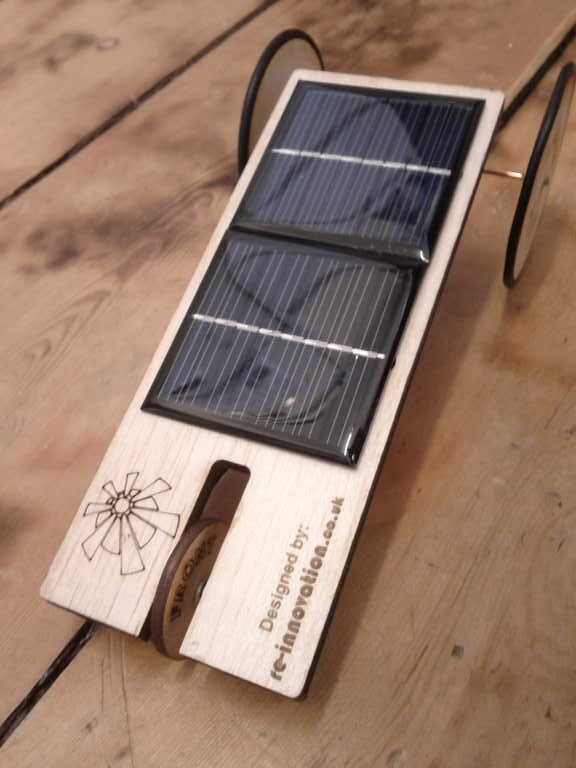 Here are photos of the designs we eventually came up with – this included small solar car kits, wind turbines with adjustable blades and a micro hydro turbine. These kits have been designed to be used outside, if the sun is shining, or inside using hand-held bright lamps. 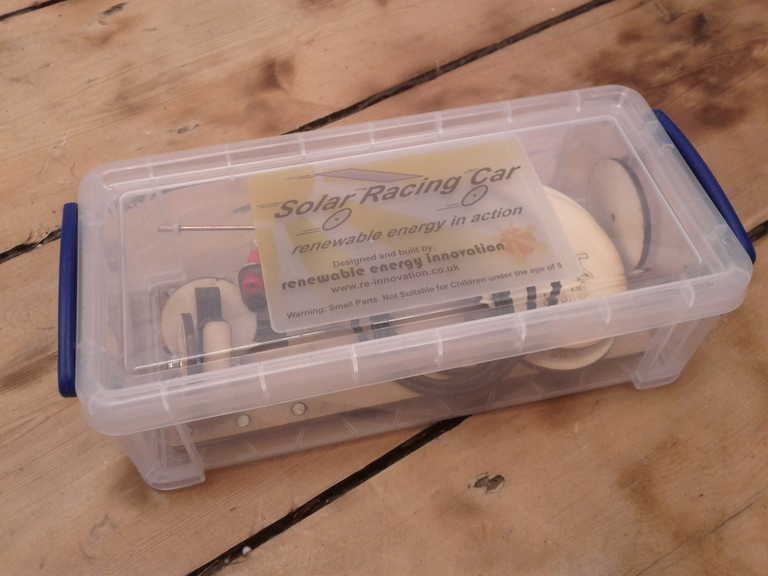 They will be used with various school groups within Nottinghamshire to introduce renewable energy, mechanics and physics in a fun and interactive way. We had already supplied similar kits to Nottingham City Council. We produced 30 of these kits, plus a few spares. 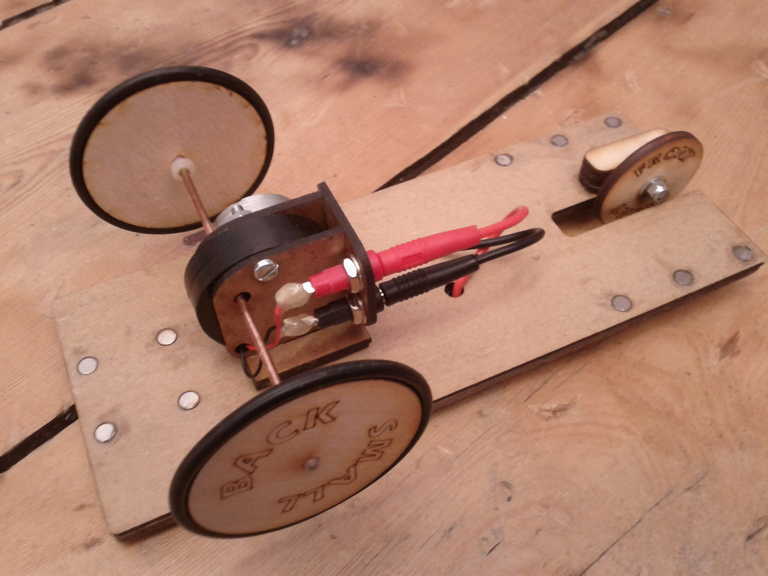 The motor and front wheels are held on using strong magnets. These can easily be removed and adjusted. Different wheels can be used to change the speed of the vehicle. Tyres can be added to affect the grip. 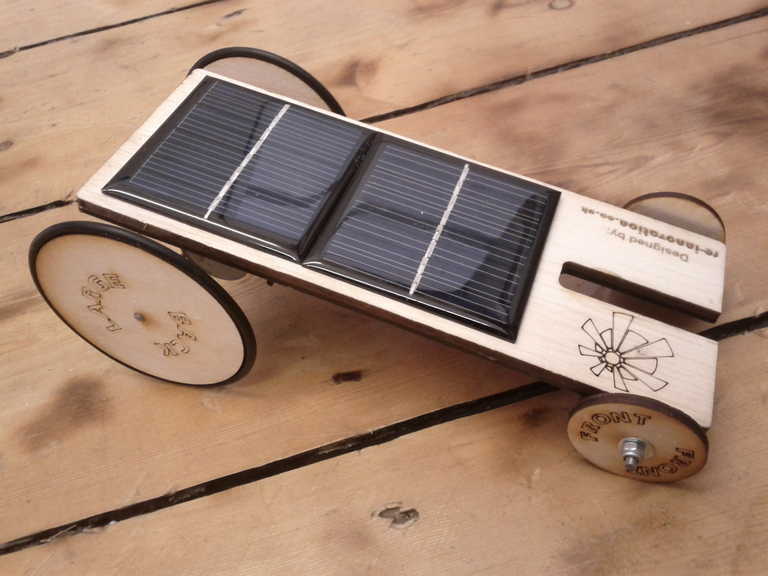 The solar panels have red and black wires, which can be reversed to make the car move in the opposite direction. 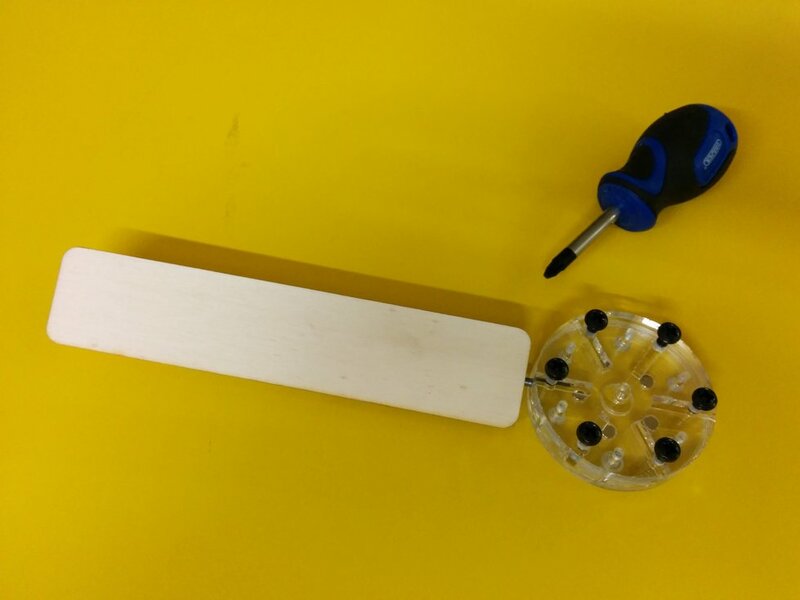 Teachers materials have also been developed for use with these kits, which are shown below. 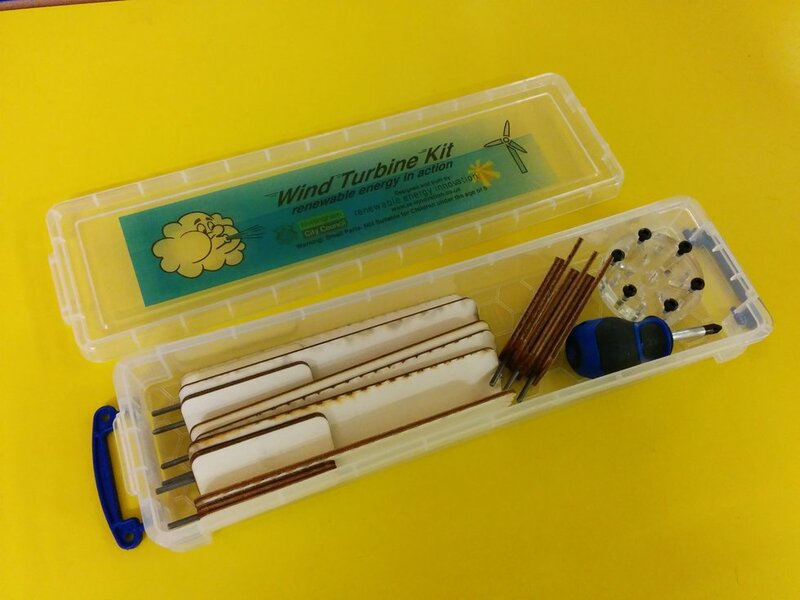 These kits include a set of small wind turbine blades. These fit into a hub unit and their angle and the number of blades can be adjusted. These hub and blade units then fit onto a wind turbine base unit (using our friends, the magnets, again!). An industrial fan is then used to blow the blades around. 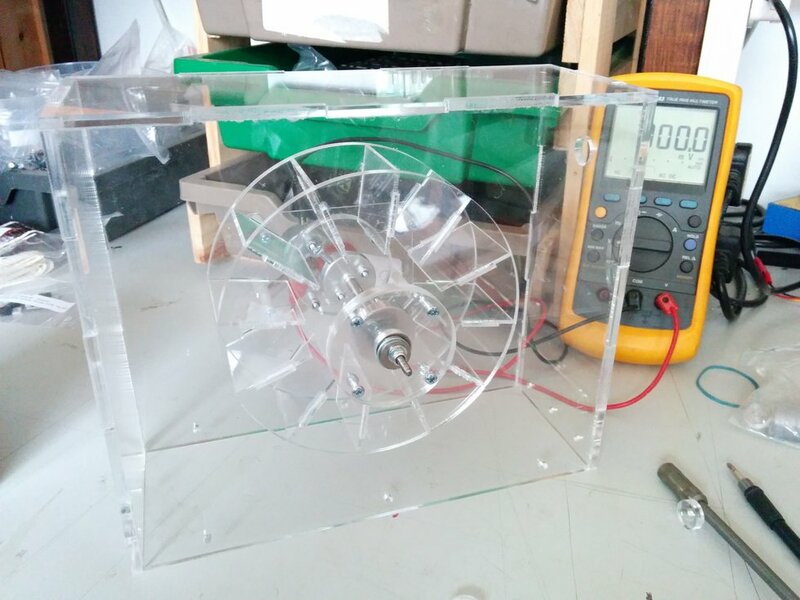 There is a very small generator and a large LED display which shows the voltage (which is proportional to the speed). The competition element is to try and get the highest voltage from your blade unit. The base unit with blades and hub attached. These are the kits that the students get. 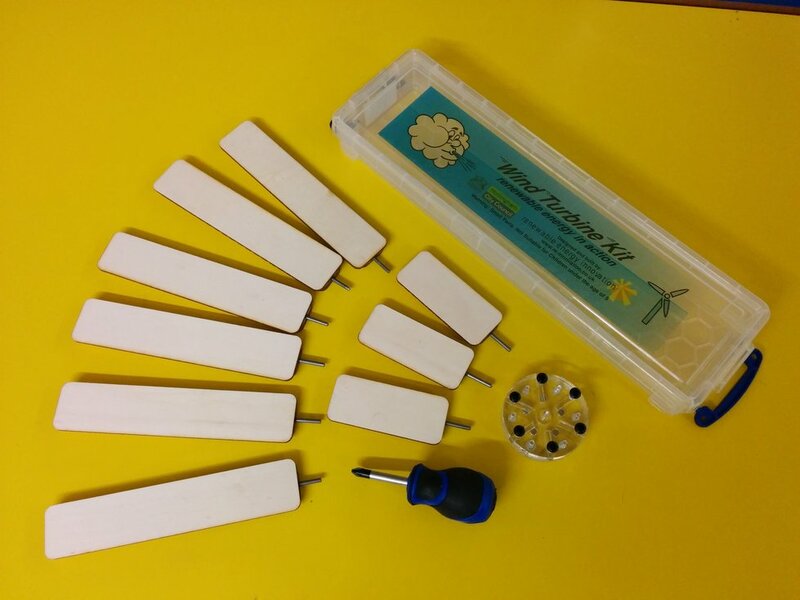 They include a range of different sized/shaped blades (at least 8 in each pack of 7 different shapes), along with a hub connector and a screwdriver. The blades are attached to the hubs with machine screws tightened by a screwdriver. The students can adjust their angle to see the effect it has. The blades mount to the base using magnets. 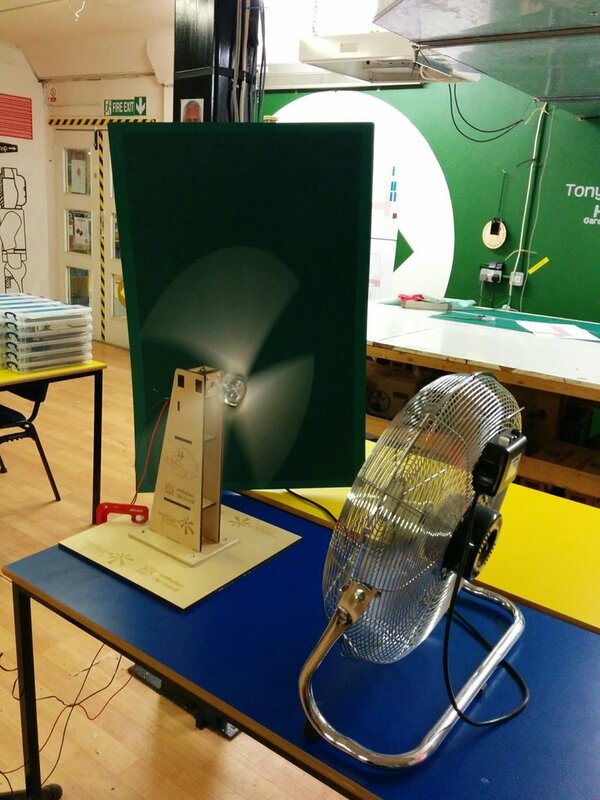 An industrial fan provides three different levels of wind speed. The hubs connect to the base unit with 5 x magnets. A central pillar stops the hub flying off. 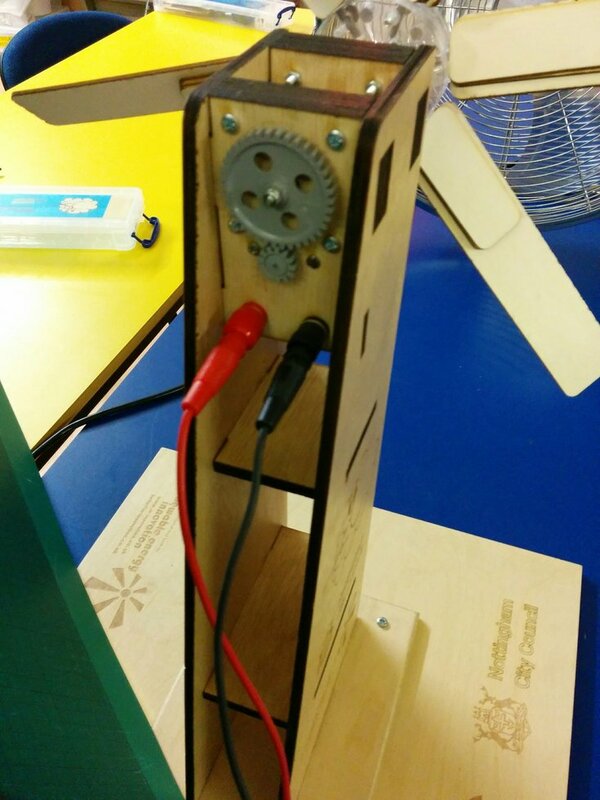 The generator is a simple motor run in reverse with some gearing to increase the speed. The spindle runs on two sets of ball bearings and runs very freely. The third of the big three renewable energy sources is hydro power – energy from falling water. 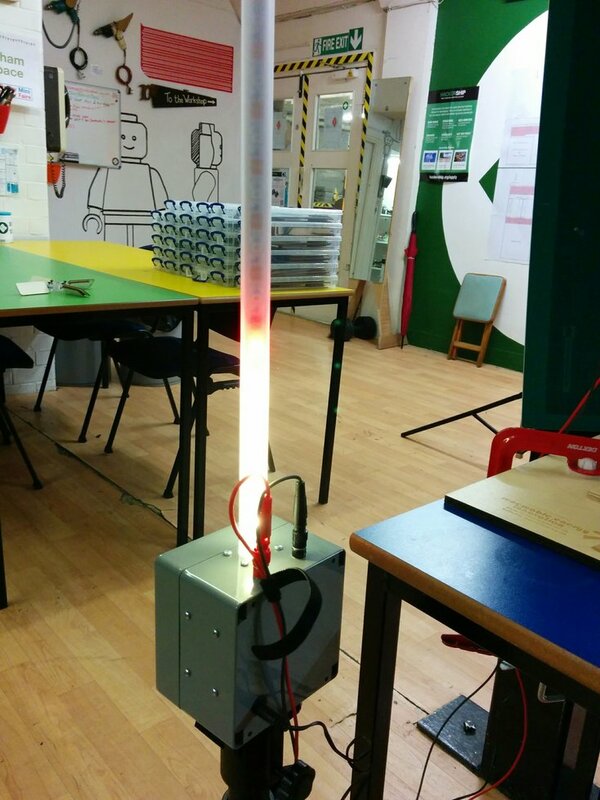 This was much harder to design as a kit for each student, so we decided to produce one large demonstration unit which can be used to show the whole group. This was produced with a metal frame and two plastic reservoirs, one at the top and one at the bottom. 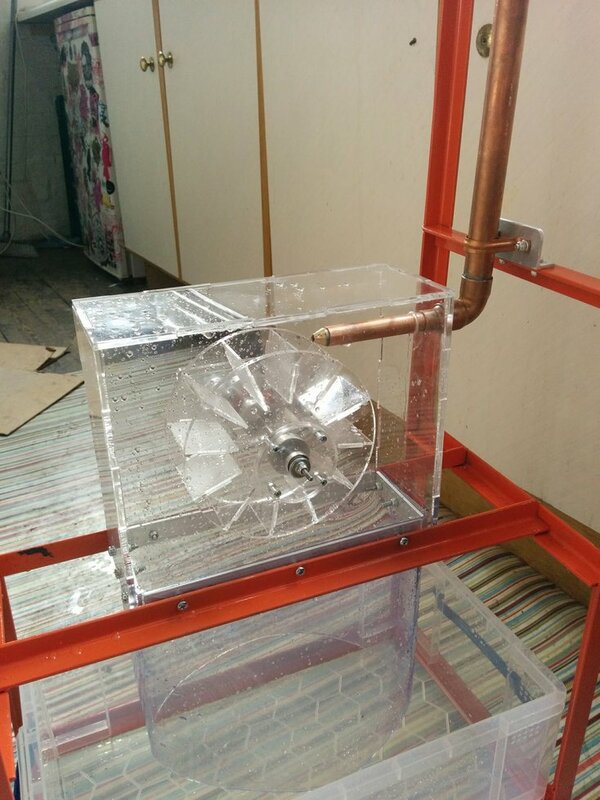 The top tank is filled with water and this flows, via pipes and a large valve, to a laser-cut cross-flow turbine. 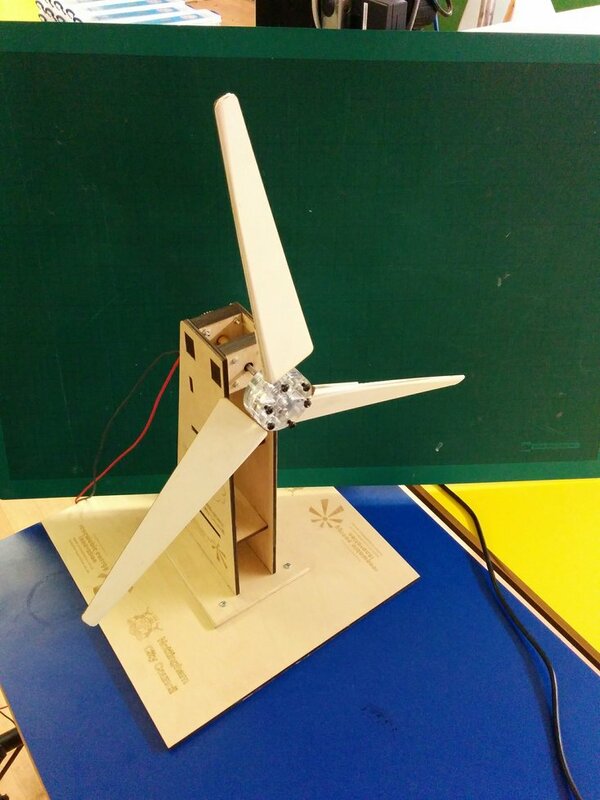 This has a small generator and produces a voltage proportional to the speed of rotation of the turbine. This can be pluged into the large LED display unit (the same one supplied for the wind turbine kits) to show the ‘power’ produced. The control valve can be adjusted to see what effect controlling the water flow has on the voltage. Hydro power is proportional to flow (the amount of water) and the head (distance the water drops), but unfortunately we cannot adjust the head (maybe for the next version of this unit?…). 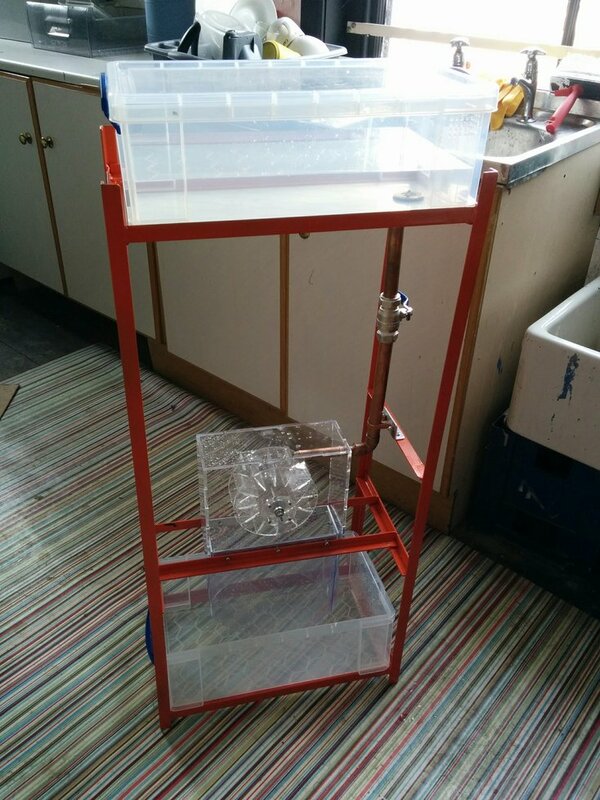 The metal frame holds two water tanks. Water flows through a connector in the base of the top tank through the turbine to the bottom tank. This can then be removed and the water recycled. 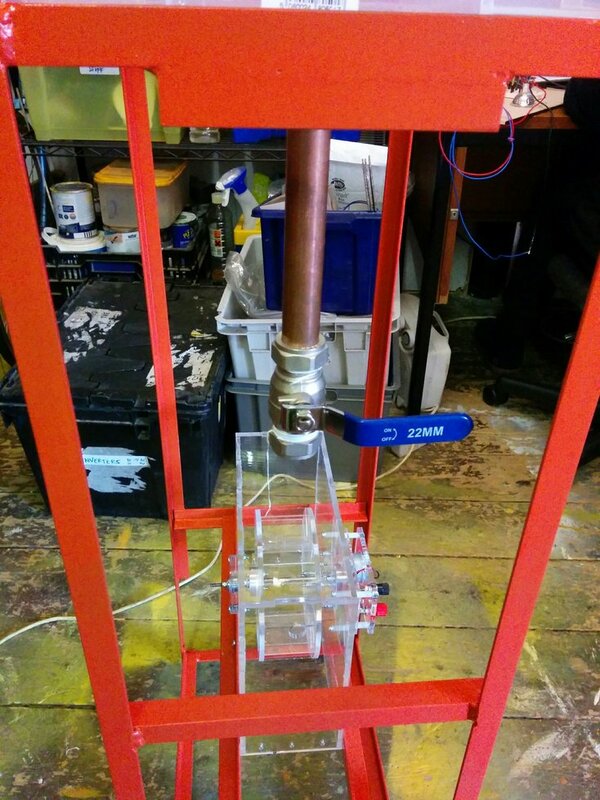 Standard copper pipe is used, but with a bespoke brass nozzle soldered in. A quarter-turn ball valve is used to control the flow of water from the top tank. 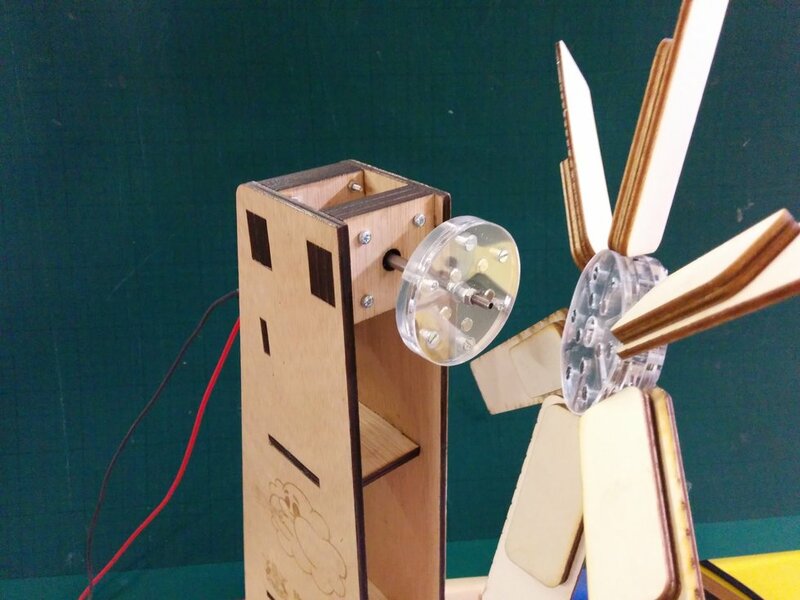 The ‘crossflow’ type turbine has been designed in CAD and cut out of 5mm and 2mm acrylic on a laser cutter. 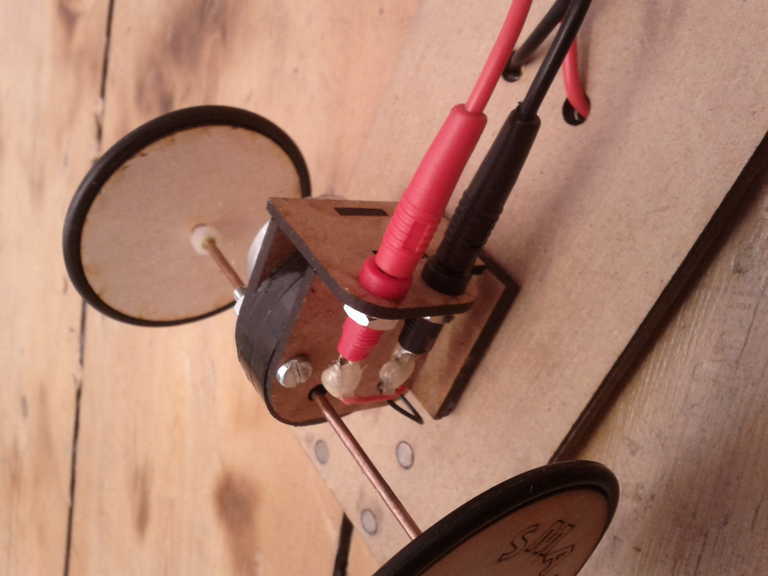 There is small motor used as a generator which produces up to 1.5V when spun at full speed. The hydro demonstration unit was the last part to be supplied and I hope to get better pictures of the equipment in action. If you are interested in products and kits like this, then please email us.